Charles Colson, an adviser to President Richard Nixon who was involved in the Watergate scandal and later became an evangelical preacher, has died aged 80. He was known as the "hatchet man" for Mr Nixon and served seven months in jail for his role in discrediting a political opponent. Later, he started a prison ministry and campaigned for penal reform. The father of three died in hospital in Fairfax, Virginia, of complications from a brain haemorrhage. 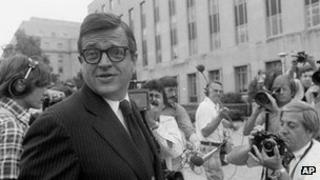 Charles "Chuck" Colson had a reputation as a hard-nosed political operator and was once described by President Nixon as the son he never had. He helped the Republican candidate to a landslide victory in 1972, saying he would "walk over his own grandmother" to ensure Richard Nixon's re-election. In 1971, he wrote a now infamous "enemies list" naming his boss's major political critics and opponents. His role in the Watergate scandal was limited, but he pleaded guilty to obstructing justice after he was involved in earlier efforts to discredit Daniel Ellsberg, who had leaked secret government documents about the Vietnam War, which became known as the Pentagon Papers. A break-in was organised at the office of Mr Ellsberg's psychiatrist, in a search for documents which could be used to blacken his reputation. President Nixon's right-hand man served seven months in jail, although he was not convicted of organising the Ellsberg or Watergate break-ins themselves. He came out of prison claiming to be a new man, renouncing the political machinations of his past and embracing his religious faith. Chuck Colson spent the next 35 years as a leading campaigner for prison reform, founding the Prison Fellowship Ministries in 1976. He was named as one of Time magazine's "25 Most Influential Evangelicals in America" in 2005, having written over 200 books in his lifetime. Later in life he lived in Naples, Florida, and in 2000 the state Governor Jeb Bush restored his civil rights, including the right to vote, which he lost after he was convicted. Just how bad are American 'supermax' prisons? How did Nixon shape US politics?